Monday was the final class period for Forum this semester. In a way it’s hard to believe it’s all over and done with but within a week we (and you) could be holding a copy of the completed magazine, the very thing all that work was for. Monday was the last class but it was far from typical. We talked about a few things, the upcoming reading, handed in final portfolios, got old work back. It was a quiet evening far removed from all those nights filled with proofreading, discussion and decision. In the past we’ve had food and drink on the last day of class; once we went out for coffee. In other words, this end of semester was slightly anticlimactic as life often is. There is also the upcoming reading at L’s Caffee which should make for a bit of a celebration. I suppose I’m commenting on the strangeness of ending up somewhere that is quite different from where we started. But could it really happen any other way? It was dark when class broke up on the first night and now that it’s another season, it was still light on that final day (also class ended a bit earlier). Time marches on. And cliché as it may sound I certainly learned new things about myself and about the process of producing Forum even though it wasn’t my first rodeo. Although before I go suggesting the destination isn’t important I should probably say that in this case it is — the destination being the magazine. It’s almost here and again, you can pick up a copy next Thursday at the reading at L’s Caffee. I think I can speak for the entire Forum staff when I say I hope you’ll enjoy it. L’s Caffe have been kind enough to sponsor a reading/fundraiser for Forum. Reading will be crime novelist and teacher Seth Harwood and poets Nic Alea and Aimee Suzara and possibly others (watch for updates). 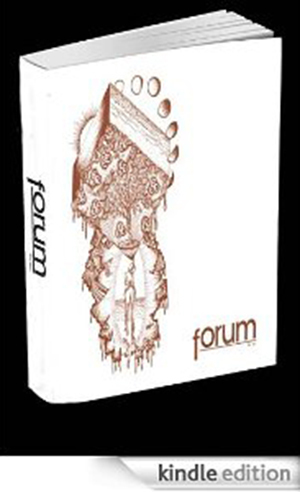 There will also be the usual open mic, maybe a raffle and, excitingly, the latest issue of Forum will be out so you’ll have your first chance to see (and/or purchase) the latest batch of poetry, prose and art from the CCSF community. Ava Stewart is a student at CCSF from Santa Cruz, CA. While spending a year in a half in Tucson at the University of Arizona, she studied the works of war author Tim O’Brien during in an English class over the course of a year. Shared below is a review of one of her favorite literary pieces, “How To Tell a True War Story,” a reflective piece O’Brien wrote to illustrate the rogue beauty of the trauma and devastation he experienced during the Vietnam War. Benjamin Bac Sierra author of the novel Barrio Bushido and poet Athena Kashyap whose work has appeared in Noe Valley Voice, Spork, The Fourth River and many others will be reading this coming Monday, May 7 in Visual Arts 114. There will also be standard reading fare — an open mic as well as food and drink and a raffle. Hope to see you there.